RECOMMENED USE: As a dietary supplement, take 1 scoop 30 minutes prior to bedtime. WARNING: Not for use by individuals under the age of 18 years. Do not use if pregnant or nursing. Keep out of the reach of children. Do not consume this product if you have a medical condition and/or taking any prescription medication. Do not exceed recommended servings. 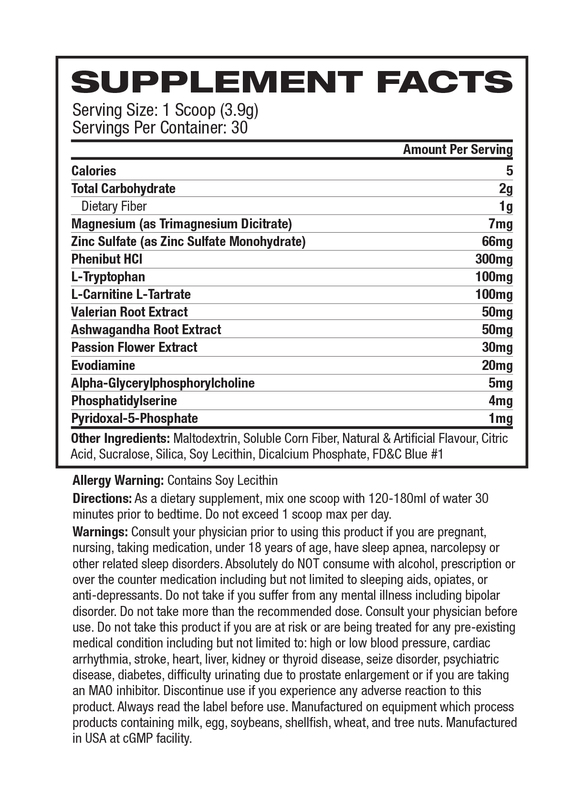 Do not use this product if you are at risk or are being treated for high blood pressure, kidney, thyroid or psychiatric disease, anxiety, depression, seizure, enlarged prostate or stroke. Before beginning any supplement or training program always consult a physician first. I'd been struggling to sleep this year due to stress and I'd tried all sorts of products to try and help, but none of them did. I received a small sample of this when ordering something online and I thought it wouldn't hurt to try it. After taking one serving I felt my muscles and my entire body relax, went into a sort of euphoric state, and then fell asleep and slept like a log. Being a small 53kg female, I now only take about a third of a serving and that gets me a good night's sleep without any drowsy effects the next day. This has honestly been one of the best additions to my training since now I can get proper rest. Thanks to Xplosiv for the sample. Fruit Punch flavour is nice and I definitely feel to sleep easily and slept well. Impossible to judge on a single serve, but first impressions are good. Prett good sleeping product for "now and then". Trouble is how fast I adapted. Cant use more than 3 days in a row or just stopped working. DiabloPM doesnt rely on the Phenibut ingredient which is why I guess Crash doesn't feel so strong with continuous use. I previously tried Arnold iron dreams and ans diablo pm which I both found to be effective so I was very eager to see how this stacked up. Mix ability was good, not great but after a bit of mixing most of the powder had dissolved. Flavour was fruit punch and tasted very nice and how I expected it to taste. What effective on my sleep did it have? Within about 15 mins I felt ready for bed, after 30 mins all I wanted to do was "crash". I fell asleep very quickly, had solid dreams on this product and woke up refreshed the next morning. Same result nearly every night too. 9/10 for me. The team at www.xplosivsupplements.co.nz sent me a FREE (yes you heard me right) sample of this. I've already been a terrible sleeper and due to my crazy work schedule I only get a couple hours sleep on Thursday Friday and Saturday nights. Trying to get back to normal sleeping patterns the rest of the week is difficult! I dropped the sachet of Crash last night and fell asleep fairly easily and had a fantastic deep sleep. I've woken up this morning a new person. I've used Ronnie Coleman's Resurrect before and that flavour is nasty. This blue raspberry flavour of pro Supps Crash was not bad at all. Very happy with this product, and will DEFINITELY be purchasing again. Thanks Xplosiv supplements! Crash also uses Phenibut. Straight up the label states the dosages of each ingredient so no proprietay blends, great start. To assist with the sleep formula is valerian root extract and passion flower extract. There is also Ashawgandha root extract which is an adaptogen and Phosphatidylserive to help maintain cortisol control. Note that these are both quite low doses, infact PS being just 4mg where you would be looking to use 100-200mg. Infact I�m a huge fan of this ingredient and take it standalone anyway. Evodamine is also included and can help to assist in fat burning. Effect-wise I don�t have problems getting to sleep regardless of using a supplement or not. I still get woken up by the baby monitor if it makes noise and I still need to get up to pee if I�ve had too much water. I don�t feel myself �shutting down�, but then again when taking 30 mins before bed it aligns with when I normally drift off anyway. The flavour I chose was Blue Raspberry. It�s not the greatest flavour but not as strong as Iron Dream so I don�t need as much water, which means less need to go to the bathroom during the night. It's priced a tad cheaper than Iron Dream for 30 serves so that also factors into my overall score. Best sleeping aid I've tried so far.. I'll have to try more before ranking it to be honest, I'd say probably 9/10+ at least at the moment, taste is pretty good.. I remember after taking it i wasn't feeling much apart from sweats then boom could barely keep my eyes open.. Love it!